Facebook recently made updates to their Branded Content Policy, which requires verified Pages to apply a Branded Content Tag to posts featuring a third party product, brand or sponsor. 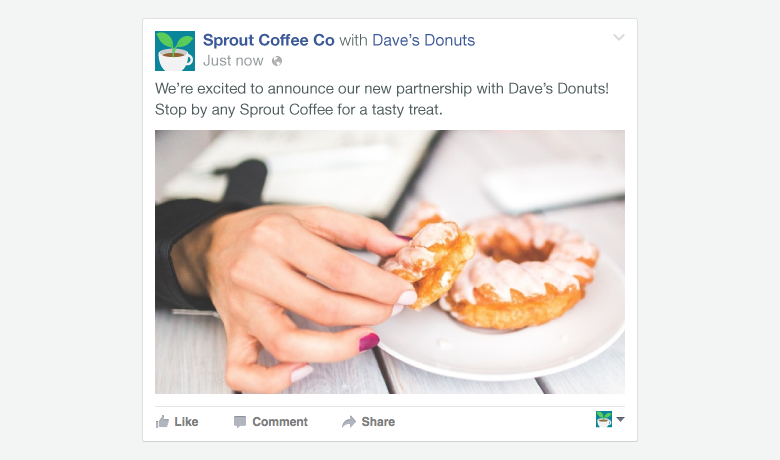 Today, we’re pleased to announce that applying a Branded Content Tag to posts is now available when publishing to verified Facebook Pages from Sprout’s Compose window. What Is Branded Content & Why Does It Matter? Branded content is nothing new. In the age of social more and more brands are taking on the role of content creators, curators and publishers. Organizations are hiring journalists, setting up newsrooms and sharing owned and third party content that resonates with their audiences. The Harvard Business Review has even reported on how businesses are investing millions into social content strategies that help increase brand awareness. With today’s update, brands can continue taking advantage of Sprout’s publishing features and plan, manage and distribute content while staying compliant with Facebook’s updated Branded Content Policy. 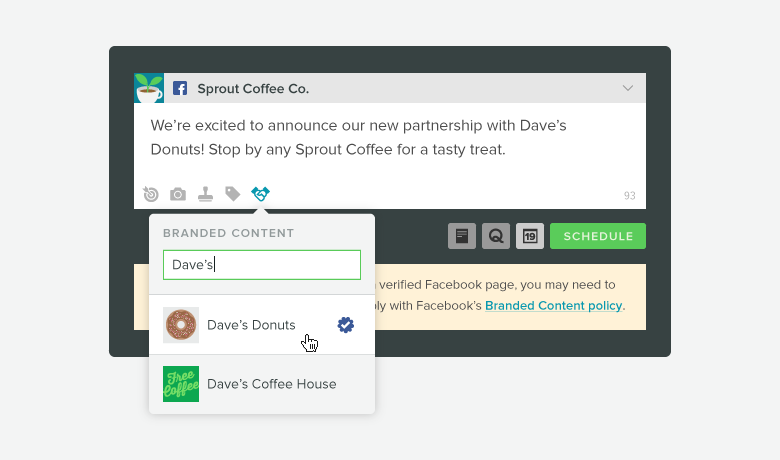 To apply the Branded Content Tag from Sprout’s Compose window, select a verified Facebook Page and click the handshake icon. The profile drop-down menu will dynamically update to refine your search results as you continue typing the name of the Page you’d like to tag. 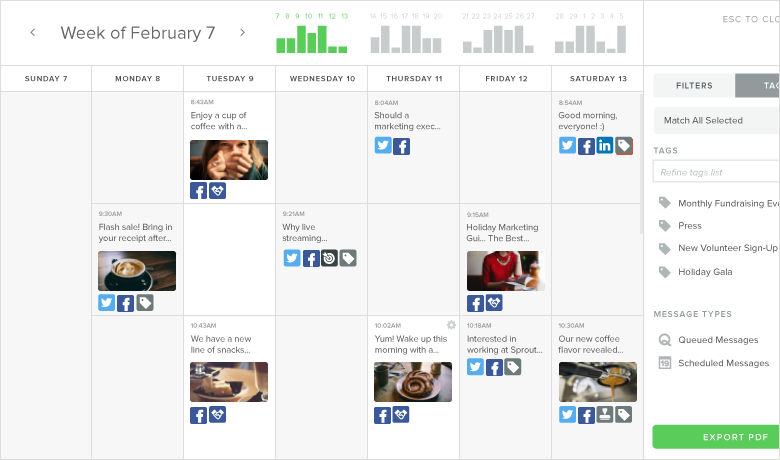 The handshake icon will also appear on the weekly publishing calendar to help you identify any scheduled or queued messages that contain the Branded Content Tag. In addition to ensuring that your posts properly align with Facebook’s latest policy, you can also use the Branded Content Tag to reach a bigger audience. If a featured third party shares your post, your impressions and reach will expand to include their fans and followers. Whether you’re engaging in a co-marketing activity, promoting a co-branded event, or simply citing your source while sharing third-party content, using the Branded Content Tag will enable both Pages to leverage the visibility of two Facebook audiences. Whatever your motivation is for publishing branded content, you can now do it while ensuring your posts align with Facebook’s policy when publishing from Sprout. As always, let us know if you have any questions or feedback.